Many people consider Peter Jackson’s The Lord of the Rings trilogy to be a classic film series, and indeed it is, but to me its “classic”-ness stems from its enormous scope and once-groundbreaking technical achievements rather than its storytelling. On the latter level, it always felt just average to me - and yes, I know I’m in the minority on this - because dramatically and emotionally, it left me a little cold and distant. There was never a character I felt I could get behind, root for or sympathize with to the point where I deeply cared about what happened in the grand scheme of the LOTR saga. Everyone in it seemed too spread out and, as a result, the substance was spread too thin. 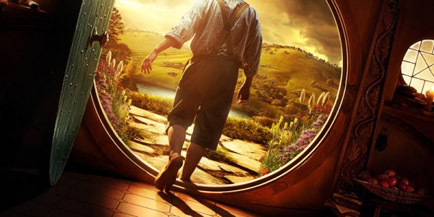 Now, over a decade later, comes The Hobbit, based on J.R.R. Tolkien’s beloved children’s story that started it all, but with this film, which was once again directed by Jackson, there’s more of a reason to be excited about and invested in it. It has the all the makings of a delightful, adventure-filled children’s tale, which it duly lives up to, with a strong central character at its core. But like its brethren before it, it’s not exactly up to the “masterpiece” label. To me, there’s just something standard about all these films that hold them back from pure greatness. Still, you can’t deny these films their virtues. As I mentioned, LOTR was a crowning technical achievement for its time, especially in regards to its sets, makeup, costumes and special effects, and The Hobbit, which takes place in the same universe, takes those elements and technology even further. This is a magnificent film too look at. It’s bright, colorful and incredibly sharp and convincing, even in the close-ups.